Official preview images for the Arrow season premiere "Inmate 4587"
“Oliver Queen is alive”… and in high-security prison! The CW today released a gallery of photos to promote the October 15 season premiere of Arrow’s seventh season. Spoilers for this episode are pretty scarce, but from these photos we do see a brand new look for Felicity (Emily Bett Rickards). (We do, however, have some interviews on our YouTube channel). An official description for the season premiere should be available soon, though we imagine it, too, will be pretty vague. You can see the new photos below. Arrow stars Stephen Amell, David Ramsey, Emily Bett Rickards, Katie Cassidy, Juliana Harkavy, Rick Gonzalez, and Echo Kellum; a number of faces and foes from the past are expected to be returning in Season 7, including Kirk Acevedo’s Ricardo Diaz. UPDATE: More untagged photos from the season premiere have now been released, including what it’s like to have lunch in the big house! Stephen Amell’s Oliver Queen is front and center in the new pics. Check them out in the slideshow below! 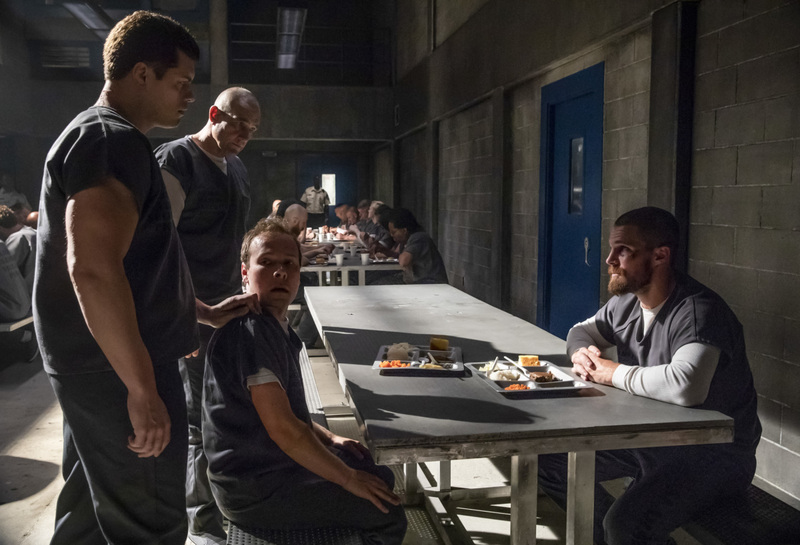 Arrow -- "Inmate #4587" -- Image Number: AR701b_0266b -- Pictured (L-R): Cody Runnels as Derek Sampson, Vinnie Jones as Danny "Brick" Brickwell, Brendan Fletcher as Stanley and Stephen Amell as Oliver Queen/Green Arrow -- Photo: Jack Rowand/The CW -- ÃÂ© 2018 The CW Network, LLC. All Rights Reserved.